Dynamic, in the context of physics, is defined as “of or relating to force or power” and “of or relating to force related to motion.” In wheelchair seating, dynamic refers to components which translate force into motion of a portion of the seating system and/or wheelchair frame and, as a result, motion of the client. Terminology is a challenge in the field of wheelchair seating and mobility. In a recent literature review, the term dynamic seating was used in several distinct ways. This term is sometimes used to describe wheelchair cushions which alternate pressure under the client, similar to an alternating pressure air mattress. Other articles used the term dynamic seating to refer to changes in pressure between the client and a cushion which occur during self-propulsion of a manual wheelchair. Still others use this term to describe a client moving in relation to a static seating system, rather than being in a constant relation to the support surfaces. I believe most wheelchair seating professionals would define dynamic seating as movement which occurs within the seat and/or wheelchair frame in response to force from the client. 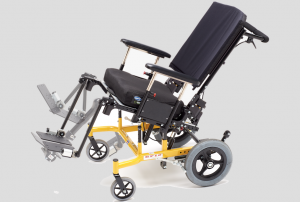 Dynamic components absorb force which in turn assists the client back to a starting position. Dynamic seating is used to achieve very specific clinical goals. Watch for our next column to learn more! Thanks for your comment Liyya! Dynamic Seating can really make a difference for many people using wheelchair seating systems!